Would you please accompany us to the station, please, lads? The 'chase', in Peckham, London, started when officers were notified that joyriders had taken a yellow Reliant Robin without the owner's consent, and were 'careering' through the streets in the area. 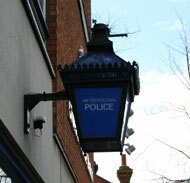 The police car used its blue light and blaring 'nee-naw' siren, to alert those being chased that they were in the wrong, and that they needed to slow down, so that they could be taken to a police station to help with an investigation. The two police officers were both wearing seatbelts. As the cars flew along at speeds not exceeding 40mph, they were required to stop at traffic lights four times, and a pedestrian crossing twice – once for a woman pushing a baby in a pram, and once for a man in a wheelchair. At one point, the vehicles became stuck in a traffic jam, but both drivers were of a calm and patient disposition, and waited until the problem had resolved itself, then continued on their way. Other officers were stationed along roads going away from Peckham, and deployed a 'stinger', a device that punctures the tyres of stolen cars, in order to stop them. As expected, the Relant Robin rode over the spikey Stinger, falling straight into the cunning trap set for them by the police. The criminals, realising the game was up, slowed down, and pulled over to the side of the road, where handcuffs were applied to their wrists. "Hello, hello, hello! What's all this, then, sonny Jim?" Then a Black Mariah turned up, and the wrongdoers were bundled into the back for some 'questioning'.